Hope Floats! 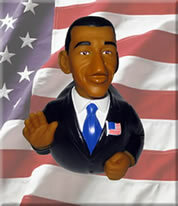 PRESIDENT BARACK OBAMA Limited Edition Rubber Ducks Are Finally Here! 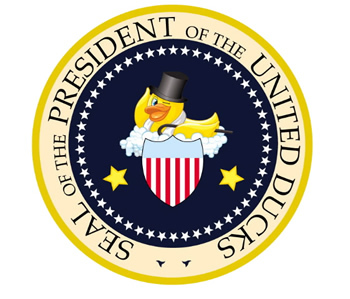 San Rafael, California – April 5th, 2009 – CelebriDucks, the original creator of the first ever celebrity rubber ducks of the greatest icons of film, music, athletics and history have now officially entered the political arena with their limited first edition Barack Obama rubber duck. Elegantly attired with an American flag lapel pin, this is no sitting duck, but rather someone who can float in choppy waters. CelebriDucks president, Craig Wolfe, remarked, “In hard times, we need a real political heavyweight in our bath to help lighten things up. Retailers can now create their own stimulus package as Barack Obama is our number one requested CelebriDuck. A chicken in every pot…a duck in every tub…finally, the duck stops here! Each one comes in his own beautiful gift box with “Yes We Can” boldly written on the front. The company is best known for their line of celebrity rubber ducks including The Wizard of Oz, Elvis Presley, Marilyn Monroe, Larry the Cable Guy, and the highly popular Gene Simmons KISS limited edition among hundreds of others. The company created a Tropical Parrot, complete with Hawaiian shirt and shades, for The Jimmy Buffet Margaritaville Cafés, and successfully sell their Blues Brother’s ducks at all House of Blues venues nationwide. They also recently broke new ground by creating the world’s first ever floating Pink Flamingo which debuted at The Flamingo Hotel in Las Vegas. CelebriDucks has produced custom rubber ducks for the NBA, Major League Baseball, the NHL, Collegiate Mascots, and NASCAR. 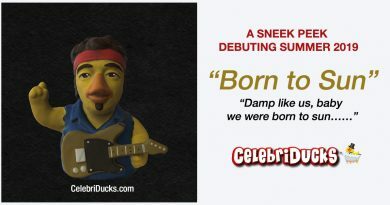 The company has pioneered a whole new collectible and to date their ducks have appeared on numerous TV shows including The Tonight Show with Jay Leno, CBS Evening Magazine, and Late Night with Conan O’Brien. CelebriDucks were voted one of the top 100 gifts by Entertainment Weekly. October 11, 2011 craig Comments Off on OUTSOURCING THE RUBBER DUCK NO MORE!